I was feeling pretty good, basking in a bit of self-satisfied glory, as David and I sat down to dinner after a 50km ride on Victoria's High Country Rail Trail. There is a sense of achievement in the first long cycle of a holiday. Then we noticed the table of eight or so people sitting next to a window in the restaurant. They were all men, except one woman. They looked familiar and there was something about them which made them look like cyclists. As the woman walked past our table I asked if we had passed them on the trail that day. Sure enough - we had. 'Did you do the whole trail?' smug me asked, confident we had either matched or outridden them. 'On road bikes,' I suggested, only slightly deflated. David and I ride mountain bikes. They are a lot slower than road bikes but handle more varied trail surfaces. We are used to being outridden by road bikers. I wasn't feeling so smug after that. I had to consult a map to find out where Shelley was. I didn't even know the trail went that far. 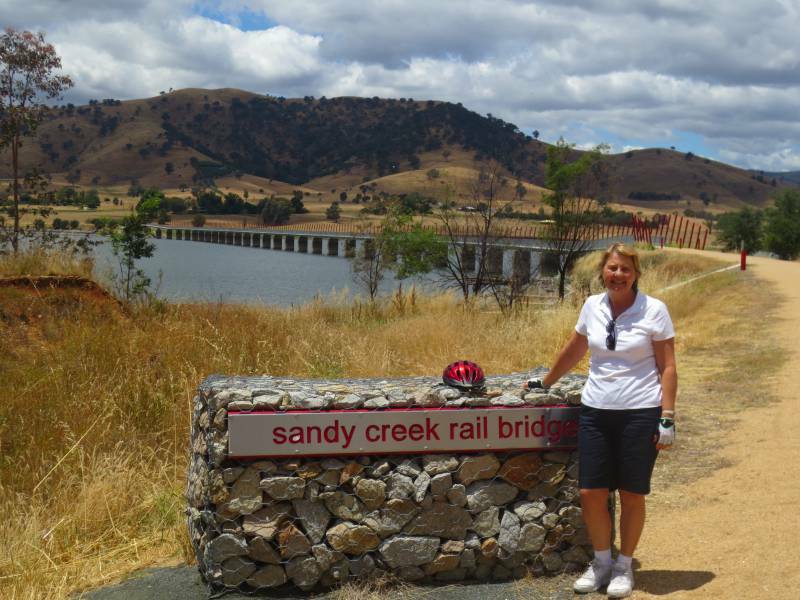 We have cycled the High Country Rail Trail several times over the past few years. It is one of those trails which keeps drawing us back. For much of its length it runs along the shores of Lake Hume. This year after months of above average rainfall the countryside was so green it was hard to believe we were in Australia. 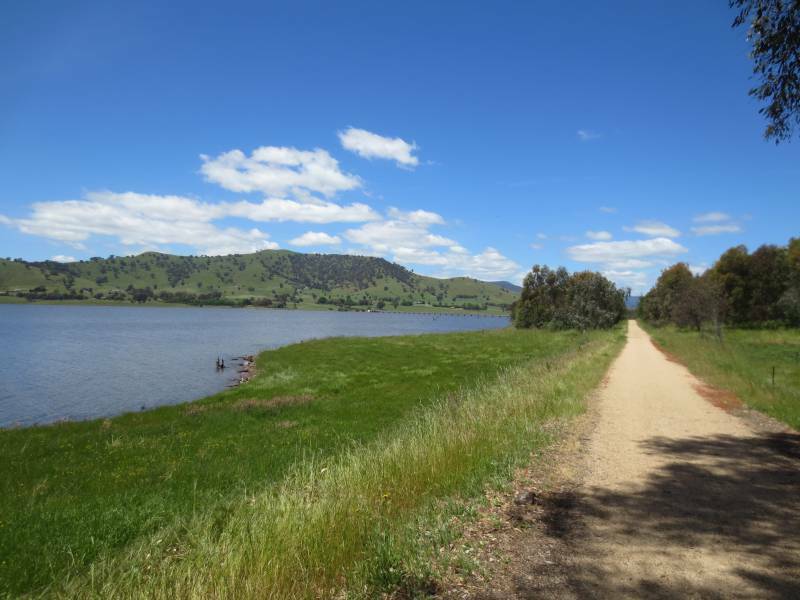 For much of its length the trail runs along the shore of Lake Hume. For the first 7 kilometres, between Ebden and Bandiana the track is sealed and according to the website has some on road sections along secondary routes. David and I usually skip this bit preferring to park our car at Ebden Reserve and begin the trail where it first meets Lake Hume. 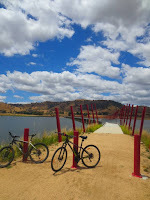 We have cycled back toward Wodonga a few times but never got much beyond the point where the trail leaves Lake Hume. There is a short tunnel which is always fun not far from the lake. If you are coming by car, follow the Murray Valley Highway south-east out of Wodonga. Keep an eye out for Ebden Reserve just after the road reaches Lake Hume. There is plenty of parking, water, toilets and picnic tables. 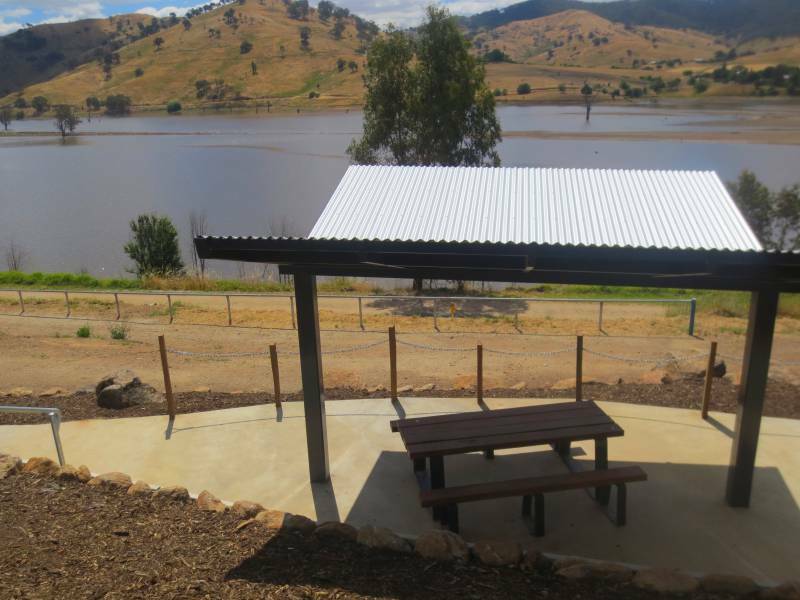 Ebden Reserve is a great place for a picnic lunch, the first of several pretty spots with picnic tables scattered along the trail. You won't find anywhere to buy lunch until you reach Tallangatta, 22 km down the trail. Even there the pickings are fairly slim with not much more than a pub, a bakery and a takeaway. This is one of those rides which reinforces Rule 6 of my six essential rules of holiday cycling, always take your own lunch'. Click on the links to read why! 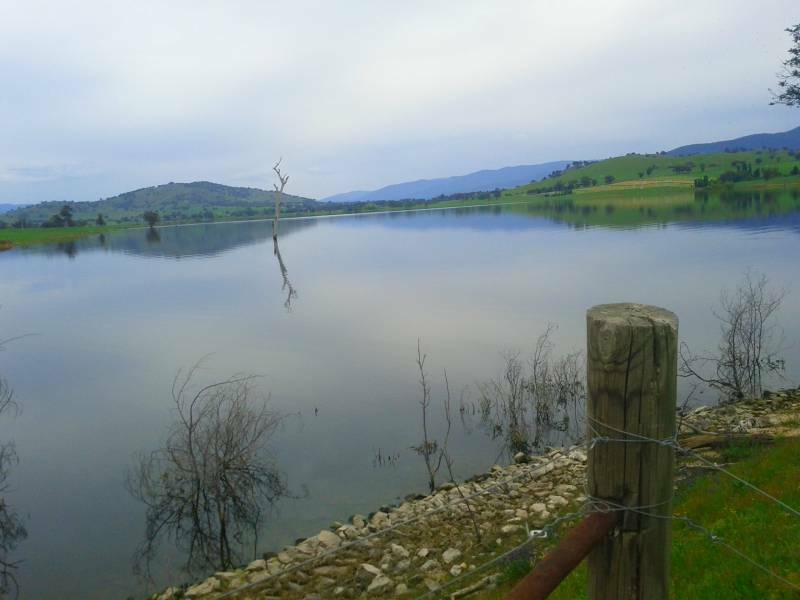 Between Ebden Reserve and Tallangatta you'll find lots of bucolic countryside with views out across the lake. The first few times we cycled the trail the area was in drought and the paddocks were that brown-grey so familiar to outback Australia. This year, after much more rain than usual, the grass was greener than I have ever seen anywhere in Oz. Old train carriages left behind when the railway closed down. Lake Hume started life with the construction of the Hume Dam. When it was completed in 1936 it was the largest dam in the Southern Hemisphere and one of the largest in the world. In 1961 the capacity was doubled as part of the Snowy Mountains Hydro-Electric Scheme. 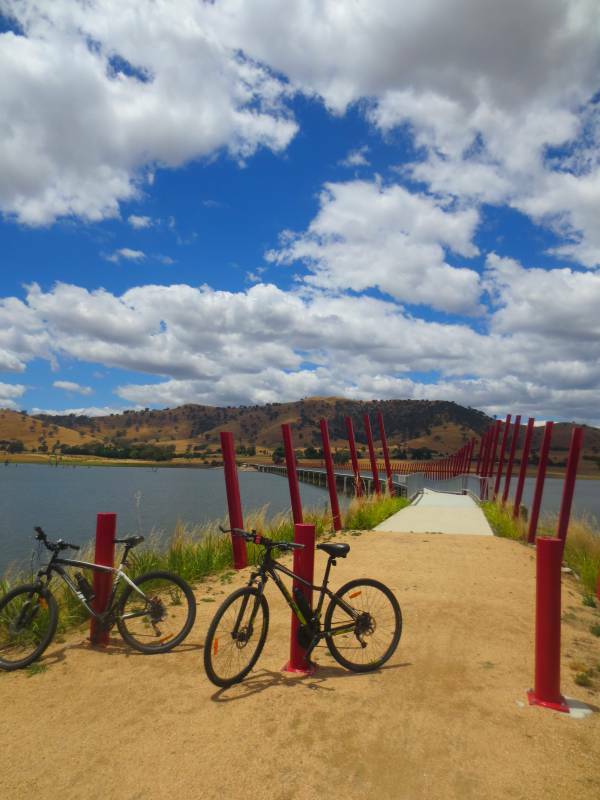 The High Country Rail Trail runs along the edge of the lake all the way to Old Tallangatta. Tallangatta - the town that moved away from itself. 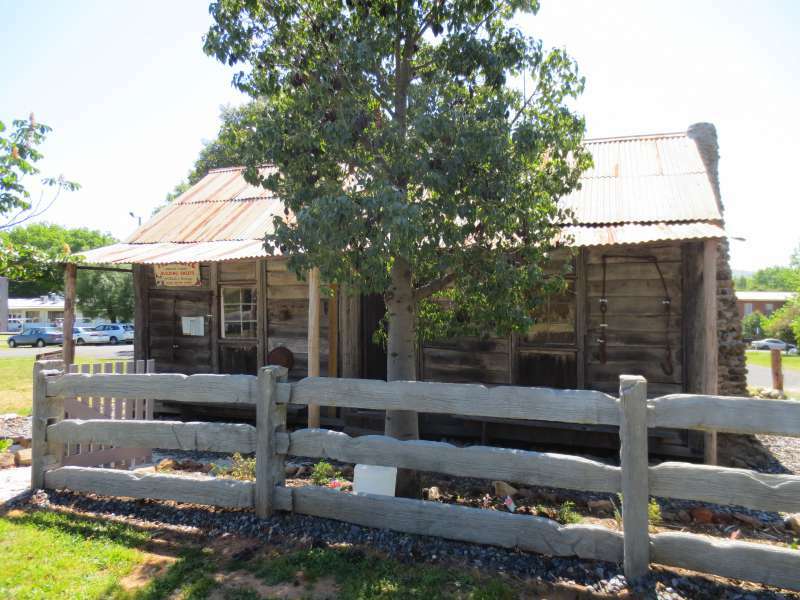 Tallangatta, with a population hovering just below 1,000 people dates back to the 1950s when the town was relocated from its original site 7 kms to the east. With the exception of a few houses on higher ground the entire town was flooded when the Hume Dam was enlarged. 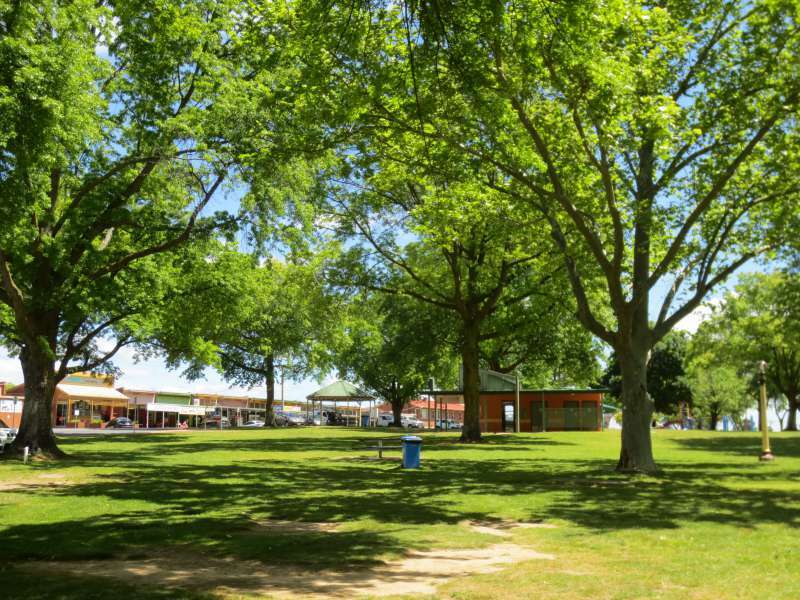 The 1950s and 60s was hardly a high point for town planning and architecture in Australia but somehow Tallangatta managed to hang on to its charm. 104 houses, two pubs, four petrol stations, two general stores, three halls and four churches were re-located - most of the timber buildings being literally picked up and set down in their new location. Two plane trees were also uprooted and replanted making the town park a great place to stop and take a breather before pushing on to the Sandy Creek Bridge and Old Tallangatta. Like everything else in Tallangatta, Lords Hut was moved here. If it is open when you cycle past it is well worth stopping and having a look around. Bridges and tunnels are always fun to cycle. They break up the monotony of putting the kilometres behind you and Sandy Creek Bridge is one of the best. Some bright spark came up with the idea of lining the bridge on one side with red metal pylons reminiscent of the columns of smoke rising from a steam train. In 2012 when the bridge was first opened they looked fabulous. In 2016 they are beginning to fade, not so much bright red now as dark pink stained here and there by the droppings of passing birds. Instead of conjuring up images of a train with a full head of steam they are beginning to look like reminders of the faded glory of a bygone age. Me, not looking too exhausted, standing in front of the new Sandy Creek Bridge in 2013. You can see how much more brown the countryside was then. It is an indication of just how long David and I have been returning to the High Country Rail Trail that my first photos of the crossing at Sandy Creek were taken when the present bridge was still on the drawing board. Sandy Creek Bridge before it was re-built. There was no cycling around this obstacle. Clustered on what was once the high ground of the old town are a few houses and small farms left behind when Tallangatta was flooded and moved to its present site. I wonder whether these residents regarded themselves as lucky their homes escaped the flood or unlucky they were left behind when the town moved away. There is a nice spot for a picnic just before Old Tallangatta. At 779 metres Shelley is the highest point on what is otherwise a relatively flat trail. The cyclists we met at dinner started their ride from Shelley, giving them a downhill run for the first 20 kms or so - perhaps that is why they were able to out cycle us so comprehensively. The section from Derbyshire to Shelley runs through state forest and pine plantations and is not contiguous with the rest of the trail which stops at Old Tallangatta. The two sections are connected by about 15 kms of the Murray Valley Highway. Take my advice and start with a small to medium bike ride - or at least give yourself plenty of rest days. It is a great way to see places and there is a lot of camaraderie with other cyclists on country trails. Rail Trails' under the header on my blog you will see I have written about a few of them. Cycling is like most things. If you start with short distances and work up to the longer ones it isn't difficult. When we first started cycling I used to be worn out after half an hour! 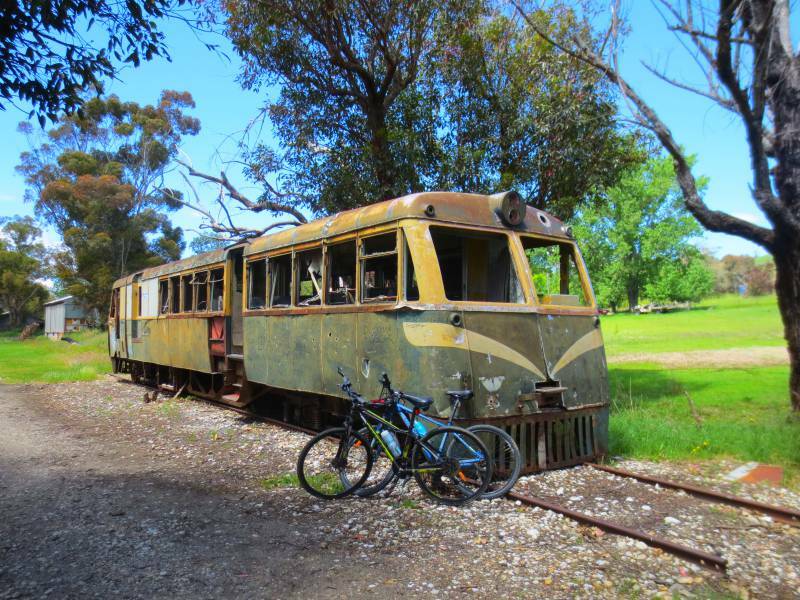 Love this photo - Old train carriages left behind when the railway closed down - you sure cycle to interesting places! The second best thing about rail trails is discovering the wonderful bits of history left behind. The BEST thing is the trails are always flat - lol! Looks like a great ride Lyn. I've long since stopped comparing myself to other riders as I am often true slowest, went the least distance. As long as we are out there having fun then all is good right? Happy riding! Haha - I couldn't agree more but just occasionally it is a bit deflating to learn others have got so much further in a day. Just start with 5 or 10 km and work up to it. You would be amazed at how quickly you can tackle 40 kms on the flat. What a fantastic ride! I was shocked to see everything so green and lush. Thanks for linking up with #wkendtravelinspiration! It is so unlike Australia to be this green, although Victoria (and Tasmania) are probably our greenest states. With the weather turning cold here in New York, and the bikes getting very little use, love seeing this. It is early summer in Australia. Perfect for cycling. I have to admit that because of your blog I have now decided that when i visit Australia I will HAVE TO add in a cycling component.....and not just drive around. Looks like Australia has some amazing trails to take and, like you, I would think 50 km is pretty good for 1 day.......there will always be those who go much further, but did they see the views you did!!?? Let me know when you plan a trip to Sydney and I will take you on my favourite city cycle around Barrangaroo and Blackwattle Bay. 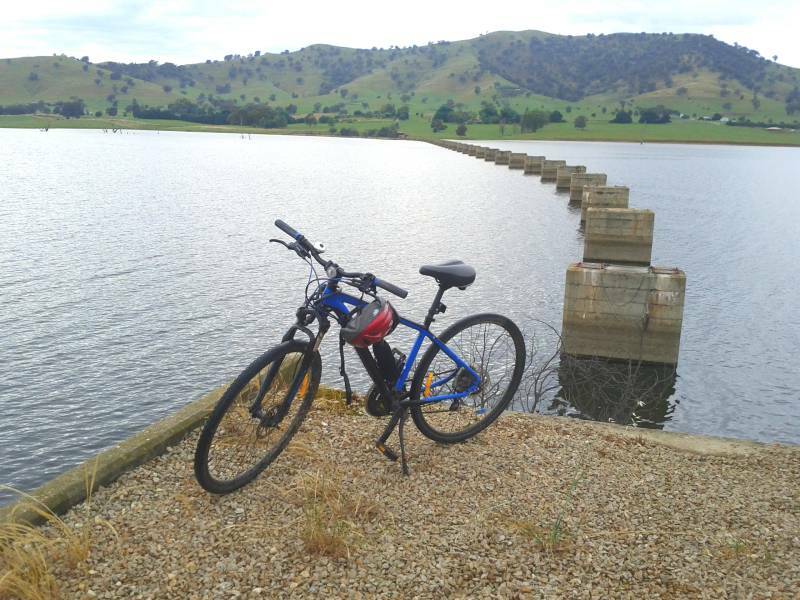 Thx for taking us along on your cycling journey to Lake Hume and area, Lyn. It looks like a magnificent journey. i'm impressed by all the cycling you guys do. It's an amazing way to see places. Maybe you'll inspire me to hop on my bike for longer journeys one of these days. Keep reading. I have plenty more cycles to write up! I must confess I prefer walking to cycling, but the High Country Rail Trail looks like a lovely and peaceful route. Almost all the trails I write up are combined walking/cycling trails. The High Country Rail Trail is great for walking.